4th of July is almost here and to celebrate we've put together one of our biggest sales yet. If you plan to work on your car this summer, you’ll appreciate 10% off parts from Ate, Meyle, and OPParts! Just in time for fireworks, we've got discounts on H3R Performance fire extinguishers. Also, you can roll with style with Camisasca license plate frames or 8380 Labs t-shirts & posters! 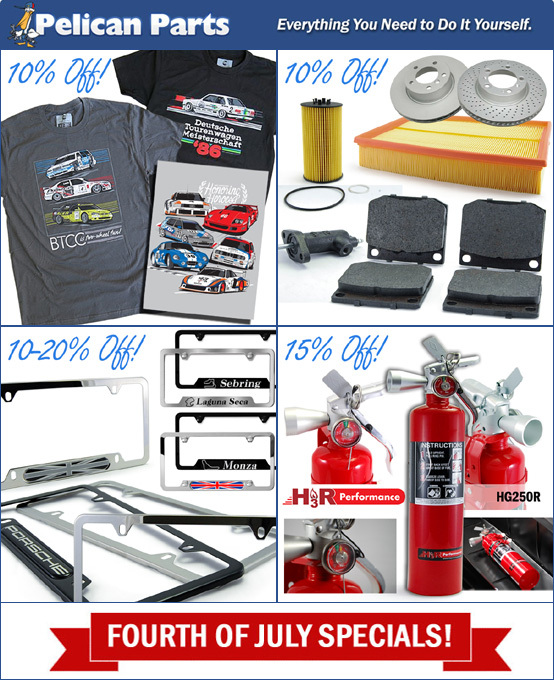 Please check out all our specials at http://www.PelicanParts.com/Promos - and Happy 4th of July! Brake Overhaul Kits For Your BMW Available At Pelican Parts! Performance DIY Alignment Tools - Qualifies For FREE Shipping! Check Engine Light & BMW assist fixed maybe? Quick Reply: Celebrate 4th of July with 10-20% Off H3R, Meyle, Ate, 8380 Labs and More!